Yes, I know the photo above isn't Stonehenge and doesn't show any Nazi sorcerers. Please bear with me. 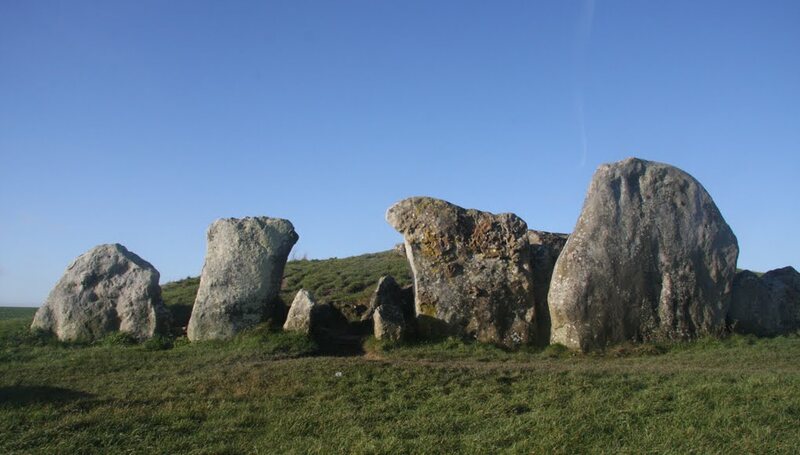 The picture is of West Kennet Long Barrow. It is near Avebury, in Wiltshire, where I stayed for the Midwinter Solstice in 2011. On the day of the solstice I went for a lovely walk from Avebury Stone Circle to Silbury Hill, then to West Kennet Long Barrow. The barrow is a Neolithic burial chamber. You can go right inside it, along a narrow passage past side chambers where our ancient ancestors reverentially laid the bones of the dead to rest. It is very atmospheric and often used by pagans, new agers and occultists for meditation, to try to contact those long passed into the underworld, or for other magical rites. On the day I was there, I met a hermit. Actually, I have no idea if he really was a hermit, but he looked like one. He was sitting cross legged on a sheepskin in a circle of candles at the heart of the barrow. His clothes were old and worn; his hair and beard were long, grey and unkempt; he was wearing a variety of holy symbols around his neck - a plain wooden cross on a knotted cord, a large crystal and, I think, a yin yang pendant. I guess he can't technically have been a hermit, because he wasn't quite alone. Sitting next to him on the sheepskin was a pretty young woman with long blond hair, slightly vacant eyes and a permanent smile. "Join us!" said the hermit, beckoning me to also sit on the sheepskin. The girl said nothing, but smiled even more widely. "Erm," I muttered, looking around and trying to think of a polite way to decline. "We need your help," he went on, insistently. "Nazi Sorcerers are at Stonehenge as we speak. They are enacting an evil occult ritual. We must counter their magic by channelling peace and love into the grid!" Don't get me wrong, I wasn't really buying into the story, but it isn't every day I get invited to step right into the plot of some pulp adventure. It was kind of fun. And, between us - the witch, the wild man and the weird young woman - on the Midwinter Solstice in that magical long barrow, it did feel as though we raised a huge amount of energy. Maybe it did some good - who knows. I can't categorically say that evil Nazi sorcerers weren't summoning dark forces at Stonehenge on the longest night of the year. my goddess--that was an interesting,not to say intriguing encounter!! did you ever find out who they were? you were obviously meant to be there at that time to meet them and take part in their ritual! !